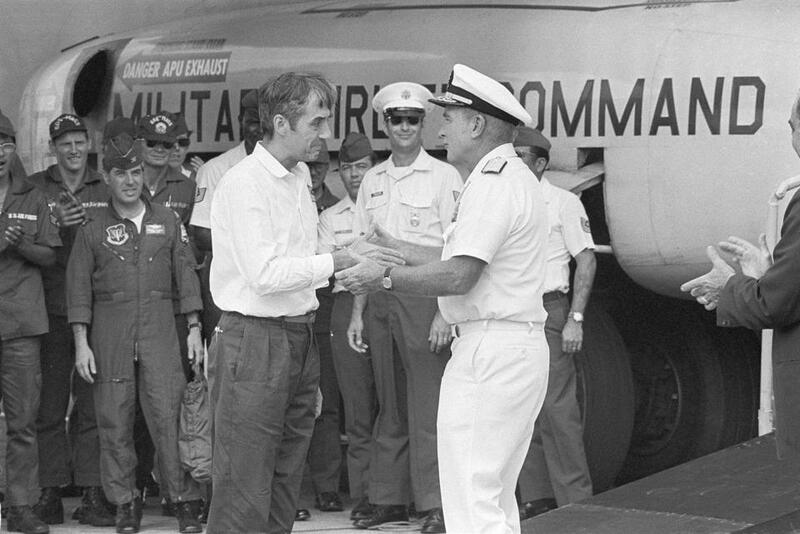 Ernest Brace (left) was greeted by Admiral Noel Gayler in Tokyo after he was released from captivity in 1973. NEW YORK — Ernest Brace — who as a pilot working for the CIA endured nearly eight years of torture during the Vietnam War, first in bamboo cages, then at the prison camp known as the Hanoi Hilton in a cell next to John McCain’s — died last Friday in Klamath Falls, Ore. He was 83. His son Michael said he had a pulmonary embolism. As a pilot for a private company under contract to fly missions for the CIA, Mr. Brace had delivered passengers and cargo to an airstrip in northern Laos in May 1965 when small-arms fire erupted. The plane was so damaged that it could not take off, and Mr. Brace was captured by Laotian Communist rebels, who handed him over to North Vietnamese troops. They treated him as a prisoner of war, despite his civilian status. For 3½ years he was mostly confined to a bamboo cage so small that when his captors occasionally let him out briefly, he was unable to walk. He tried to escape three times. Then he was transferred to the prison camp in Hanoi. At one point he heard a tapping sound from the adjacent cell and soon realized that the taps were code for letters of the alphabet. The prisoner next door was a downed Navy flier, Lieutenant Commander John S. McCain, the future senator and presidential candidate. They became vital to each other’s survival, providing comradeship despite never seeing each other’s face. Mr. Brace and McCain did not meet until 1973, months after they were released. “A guy came up to me and I looked at him and he said, ‘I’m Ernie Brace,’ ” McCain said in 2013. “I went, ‘Wow,’” he added. “It was such an emotional moment for me.” That same year, Mr. Brace was awarded the Prisoner of War Medal and two Purple Hearts. While Mr. Brace was in captivity, his wife, the former Patricia Emmons, thought he was dead, and remarried. During his recuperation at the Naval Medical Center San Diego, he met a nurse, Nancy Rusth, and married her. Besides his son Michael and his wife, he leaves three other sons, Ernest, Patrick and Cary; and eight grandchildren.